Powell’s portrayal follows in the footsteps of pop culture’s defining take on Glenn (sorry, Sam Reid in The Astronaut Wives Club). 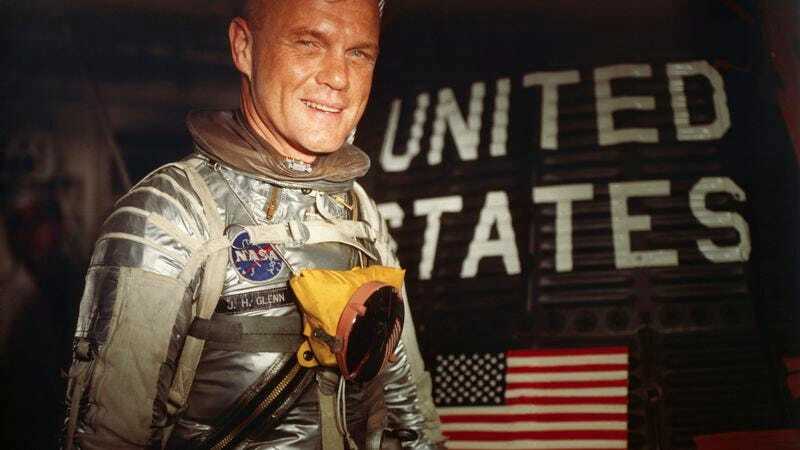 Ed Harris played Glenn in The Right Stuff, Philip Kaufman‘s adaptation of Tom Wolfe’s book about the Mercury Seven astronauts—a movie of which Glenn was not a fan. “I don’t think any of us cared for the movie The Right Stuff. I know I didn’t,” he once said, according to his Associated Press obituary. Still, it was a favorable portrait, painting Glenn as an upstanding family man who’s devoted to his wife, Annie (Mary Jo Deschanel). Though Glenn never indulged in jokey television cameos the way, say, Buzz Aldrin did, he did once poke fun at himself in a 2001 episode of Frasier, where Kelsey Grammer’s Frasier and Roz (Peri Gilpin) bicker while ignoring Glenn as he tells a goofy story about seeing aliens.